When it comes to kids’ health, food allergies are certainly nothing to sneeze at. While many food sensitivities and allergies cause little more than discomfort, itching or hives, there are those that can have potentially lethal implications. Before introducing new foods into a child’s diet, it’s wise to have a reasonable understanding of common food allergens and know the signs of an allergic reaction. 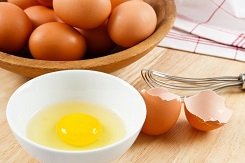 Eggs – Egg whites contain proteins that have been known to cause allergic reactions in kids and adults alike, with symptoms ranging from relatively mild to some as severe as anaphylaxis. While the protein is found in egg whites, it’s important that kids with an egg allergy avoid any egg products whatsoever. Milk – The single most common food allergy among infants and young children is a milk allergy. An estimated 2.5% of kids under the age of three are allergic to milk, and most infants with a milk allergy develop it within their first year. Some kids do outgrow milk allergies as they get older, but only an allergist’s test is a safe way of determining whether or not a milk allergy has been outgrown. Soy – According to the Food Allergy Research and Education group, the majority of children with a soy allergy will outgrow it by the time they’re ten years old. In that time, however, kids can suffer from reactions that are mild to very severe. Roughly 0.4% of kids suffer from a soy allergy, making it another common allergen. Wheat – The most predominant grain product in the United States is wheat, and it’s also one of the more common food allergens affecting children. While the vast majority of wheat-allergic kids will outgrow their sensitivities before reaching adulthood, reactions can be severe in some cases, so it’s important to avoid any and all products containing wheat if a child in the family has such an allergy. Peanuts – Between 1997 and 2008, the number of kids in the United States with a peanut allergy more than tripled. This common food allergy is becoming even more common with every passing year, and can be one of the most lethal food allergies. Kids with peanut allergies can have severe reactions from merely inhaling peanuts or coming into contact with them. Tree Nuts – Reactions to tree nuts can be potentially fatal, and only about 9% of kids suffering from a tree nut allergy will outgrow it before reaching adulthood. Younger siblings of kids with established tree nut allergies may be more likely to suffer from the same sensitivities, according to the Food Allergy Research & Education network, so talk to your allergist about sibling testing. Fish – More than half of people with a specific type of fish allergy are also allergic to other kinds of fish, so it’s wise to avoid all fish products if your child is allergic to one particular type. Most kids will not outgrow a fish allergy, and fish proteins that cause reactions can become airborne during cooking through steam. Shellfish – Shellfish allergies are another common food sensitivity, but tend to be different from allergies to finned fish. A child who’s allergic to shellfish may not be allergic to finned fish, so it’s wise to talk about further testing with your child’s doctor if she’s exhibited signs of an allergic reaction. Strawberries – There are specific proteins found in strawberries that some kids’ bodies recognize as foreign and harmful. Strawberry allergies are more common than many parents and caregivers realize, so it’s important to be cautious when introducing them into kids’ diets. Kiwi – A study funded by the Food Standards Agency shows an increasing number of reported allergies to kiwi fruit, especially among kids who suffer from other allergies. This is another unexpectedly common food allergy, and a food with which parents and caregivers should introduce to a child’s diet with caution. If a child begins exhibiting any signs of an allergic reaction or complaining of discomfort after eating a new food, it’s best to seek emergency medical treatment. Even if the reaction is a mild one or a false alarm altogether, you can’t be too cautious when you’re dealing with potential anaphylaxis.